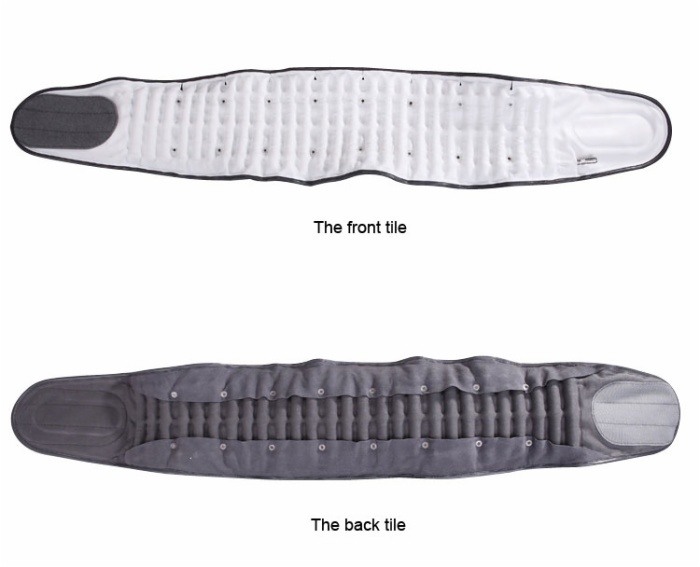 1.Matrix from the pressure column:Strong vertical support, can play a role in protecting the lumbar spine against gravity oppression. 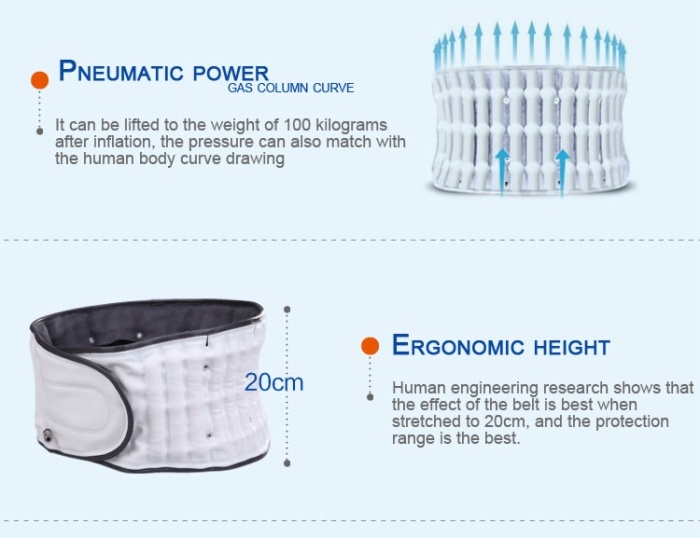 2.Disposable deflated bladder molding technology:Anti-C in accordance with the body's natural curvature arc great efforts of traction.3. 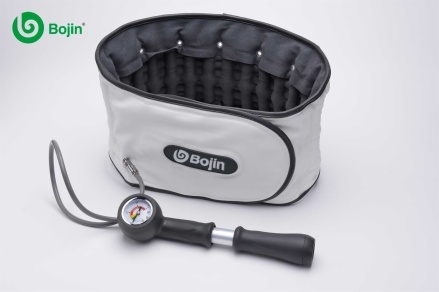 High-quality instrument air pump, inflatable fast and easy, precise pressure display, at a glance. 4.100% cotton lining waist, wear comfortable sweat, and can reduce sensitive skin allergies. 5.Two-way adjustable velcro connection, easy operation, suitable for different people use waist. 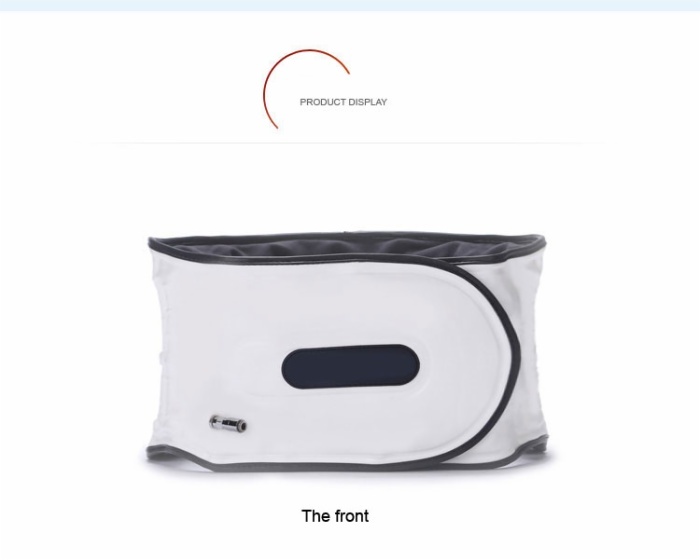 This product is comfortable to wear, effective use of the blood vessels to relieve pressure on nerves and other tissues to relieve pain.Re-use, so that psoas relaxation, the gap increased lumbar vertebral artery straightened, promote blood circulation, speed up metabolism, reduce nerve root compression, it is conducive to the proliferation of local congestion and swelling subside, so that lumbar symptoms improved or disappeared completely. 1.Open the packing, take out lumbar holder. 2.According to the correct way to wear a lumbar holder, choose suitable for waist models. 3.Pep talk before the stroke is fixed with the connection valve and manual assist device docking (fast connection). 5.Need to remove the lumbar vertebra tractor, the first to push the quick joint sleeve or counterclockwise rotary joint, slowly deflated. 1.Pregnant woman.2.Patients with skin disease. 1.After the failure of the use of prohibited products. 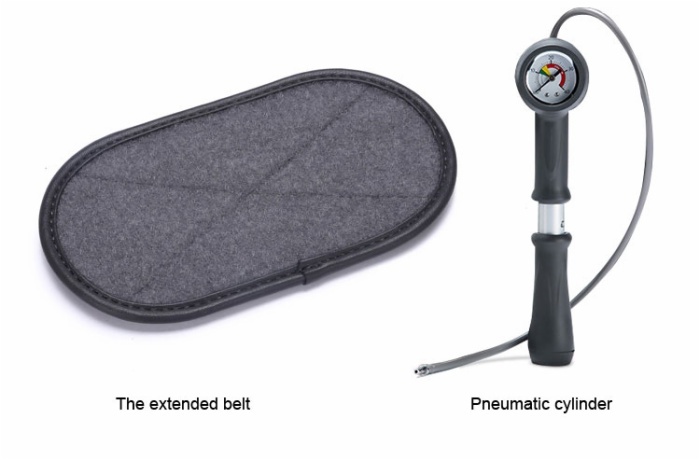 2.The product shall operate under professional medical personnel or medical personnel to guide the use. 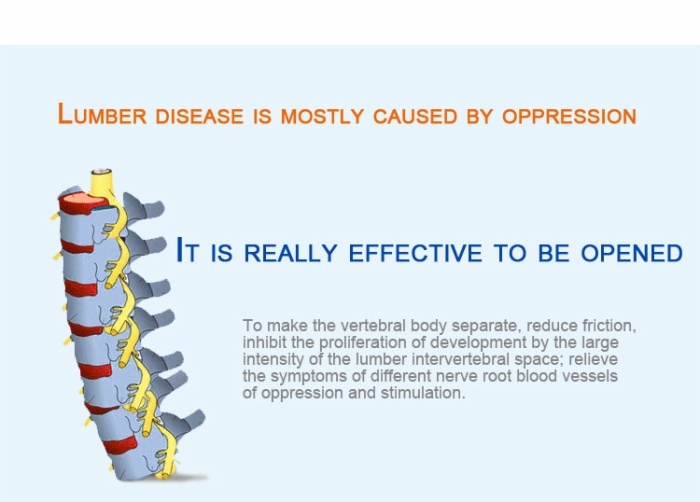 3.If found using lumbar fixation allergy or discomfort, please stop using it immediately. 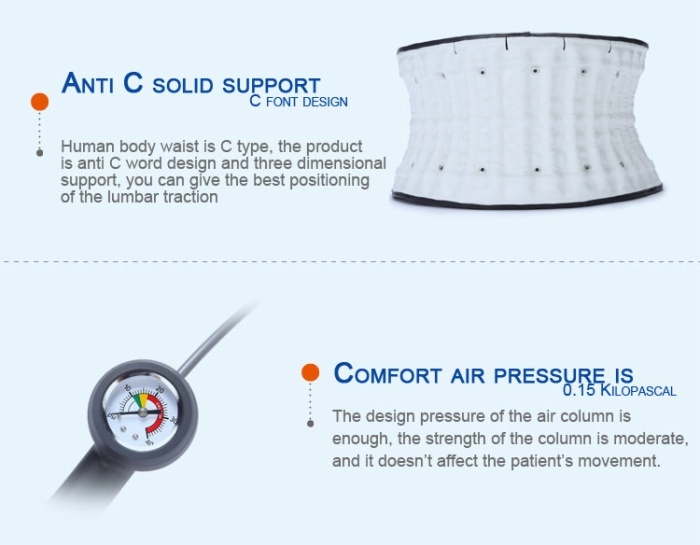 5.Try to make the treatment of waist relax, slowly add pressure to enhance traction effect. 6.Inflatable should be gradual and not excessive, pressure must not be greater than 15Psi, otherwise easily burst the balloon. 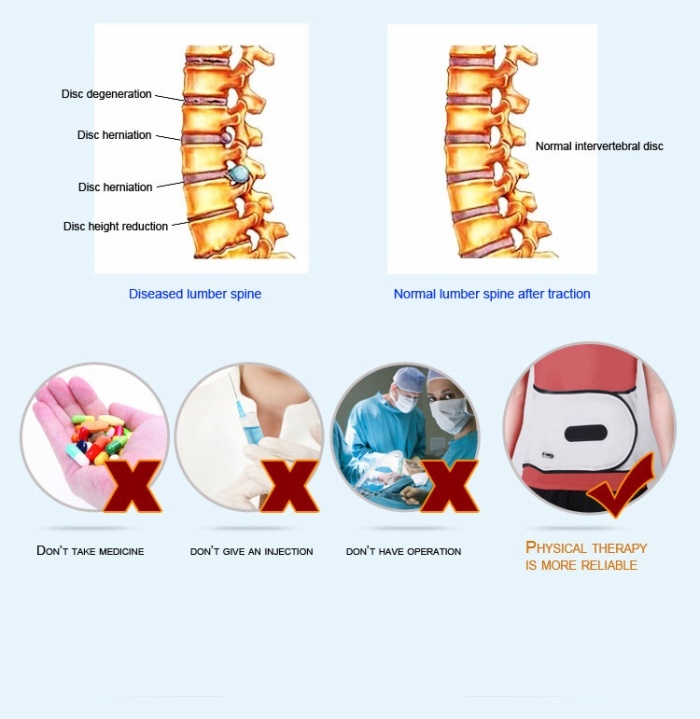 Back pain or other abnormal reactions occur when doing therapy should slowly deflated until undesirable symptoms disappear, then re-adjust to use. 7.When using the strap to avoid contact with hard objects, the strap surface stains, you can stick with a soft brush to clean water at inflated, non blisters, rubbing or brushing. Packaged products should be stored at room temperature, relative humidity less than 75%, non-corrosive gases and ventilated clean room.